Europacable is the organization committed to representing the wire and cable industry in relevant EU policy debates. Chief Executive Officer Valerio Battista President of Europacable, the association which represents almost the entire European wire and cable industry. The election of Valerio Battista was resolved during the latest General Assembly of the association which took place in Brussels in conjunction with the kick-off of the “Visualizing Energy” week, with Europacable playing an integral and visible role in the initiative. The production scope of Europacable members covers the full range of insulated wires and cables, including energy, industrial, building, automotive, special application, metallic and optical fibre data and telecommunications wires and cables, as well as winding wires and medium voltage accessories. “Wire and cable products are essential to reliable, sustainable, affordable and publicly acceptable electricity and data transmission and Europacable member companies are global technology leaders in these sectors” declared Battista. “Against this background, Europacable is committed to be recognized as a fully transparent lobby organization, representing the wire and cable industry in relevant EU policy debates, to be a trusted source of technical information on wire and cable products and to be actively engaged in relevant standardization processes and to raise the visibility of the European cable and wire industry, a unique industry joining SMEs and globally operating firms, striving to secure Europe´s technology leadership”. Marcello Del Brenna was confirmed Chairman of the Europacable Utilities Board (EPCU) until 2015 and will continue to lead the Europacable Underground Marketing Project (UMP), while Philippe Vanhille was confirmed Chairman of the Europacable Telecommunications Board (ETC) until 2016 taking over from Phil Edwards. 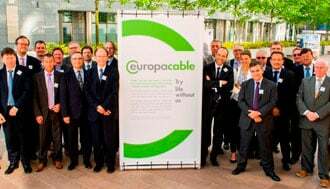 Antonio Traversi was appointed Chairman of Europacable Environmental Committee (ECOE) taking care of the arising Environmental issues for cable Industry. Europacable is continuing its efforts aimed at being increasingly involved in the European Union debates, with the ultimate goal of giving a crucial contribution to revamping the Union’s economy and increasing the continent competitiveness in the global arena. Two years into its re-organisation, Europacable has increased its presence considerably in Brussels. It is now strongly involved in the EU energy, data and telecommunication debates, with the European Commission, the European Parliament and key actors such as ENTSO-E, the European representation of electricity transmission operators.